I just wanted to pop in and say Hi. I don’t know how much time I will have to post today, so I wanted to at least tell you how wonderful I think you are, and so does Jesus!! You are fearfully and wonderfully made, His works are wonderful, I know that full well!! I am taking my older boys, Shane and Drew, 23 and 18, to get wisdom teeth extracted this morning. Then I will be home nursing them back to health with jello, mashed potatoes, and chicken broth!! They are extremely excited!! Actually, I think Dad is the most nervous and he isn’t even going, : ) Please keep them in your prayers!! Then off to take Lindsey, her husband, Andy, and my beautiful granddaughter to the airport. They are headed to Las Vegas to visit some of his family. They will be gone a WHOLE week. That’s a long time without Ella. Maybe I can get a lot accomplished while she is gone. Believing you all will have a very joyful day!! Praise Jesus for such a beautiful, NEW day. I’m usually a pretty peppy person (say that 5 times fast), I don’t have too many down days, so when I do, everyone notices. Unfortunately, this has a tendency to make it worse, and WOW, yesterday was a doozy. I blogged my usual Why I “Count it all Joy” Wednesday, and wouldn’t you know it, the enemy showed up in a BIG way to steal my joy!! He jumped right on my back and went for a ride. He picked at me in just about every area available and for a time, I let him. I’m reading a book for review about friendships, the good, the bad, and the ugly. It has really made me think and pray a lot about the kind of friend I am, the kind of friends I have, and the kind of friends I want. Of course, the enemy had a field day with this one. Jesus says, “A friend loves at ALL time.” and I pray I am always that kind of friend!! As most of you know, I lost my mom last August. It was very sudden and unexpected and although she has been gone 8 months, there are still so many unresolved issues, emotional issues stemming from childhood and issues regarding the circumstances of her death. Unfortunately, these issues have prolonged the grieving process. Boy does the enemy love to pick at those, he knows I have forgiven all things, but loves to nudge me to pick them back up. Keep your love for one another at full strength, because love covers a multitude of sins. 1 Peter 4:8. Like I started, Praise Jesus for such a beautiful, NEW day!! The truth is, the enemy comes to kill, steal, and destroy, but Jesus came to give me life to the fullest. I am so filled with JOY because I know that even when the enemy attacks me and even when I seem to let him for a bit, Jesus is there watching and helping me through it. He is there to make my life whole. He is there loving me no matter what. He is there lifting me the whole time the enemy is trying to beat me down. He is there giving me the strength to shake it off. I had to laugh this morning because when I was posting my JOY list yesterday, at the last minute I put in the one that said “I am filled with joy because the Lord promises that no matter what happens, no matter the trials, no matter the disappointment, JOY comes in the morning!! !” Boy am I THANKFUL for that one!! Believing you are all having a wonderful, sunny day!! I am filled with joy because this is the day that the Lord has made and I am rejoicing in it. The sun is shining and my flowers are beautiful. I am filled with joy because we busted it this year and this is our last week of school. I am filled with joy because the Lord has a plan for our lives and HE is directing us even when we don’t know what to do or where to go. I am filled with joy because even after all these years of serving the Lord, we are continuing to grow in Him together as a family and individually. I am filled with joy because the Lord promises that no matter what happens, no matter the trials, no matter the disappointment, JOY comes in the morning!!! Hallelujah!!! I am filled with joy because He offers everything we need to live a life full of joy which comes from knowing Him. I am filled with joy because I been spending this week with my sweet granddaughter, Ella, before she leaves Friday for a LONG week!! Being a Nanny is pure JOY!! I am filled with joy because I am planning a vacation for us this summer at the beach!!! We will be surrounded by pure beauty created just for us by the Lord!!! Thank you for all the beautiful things you created for our pleasure!!! I am filled with joy because I have a wonderful, talented (as you saw in yesterdays post), loving husband who is back in the USA!! Praise Jesus!! Joy is a fruit of the Spirit!! Do you have it? What are your joys? Have you ever given a lot of thought to a gift for someone, you know, wanting to give that perfect gift, only to see it sit, or used in a way other than the intended? Have you ever given a gift to one of your kids that they really wanted and after the excitement wore off, it just sat, not being used? What about the gifts we were born with? How are we using those? I just love seeing the God given gifts in people. Some people have gifts that are very obvious and some have very subtle gifts. Both just as important as the other. What a boring world we would live in if we all had the same gifts. Some people are servants, some are musicians, some have the knack for making anything pretty, and the list goes on and on. The Lord is very creative when handing out gifts and for that I am thankful. What I really love though is when the gifts are used in the way they were meant to be used when given, to glorify the Lord. My husband has a wonderful gift. He is an artist, graphic designer by trade, but he paints beautifully. For years though that gift sat dormant. We were so busy doing life, raising kids, that he didn’t get many opportunities. In the last 5 years or so, because of all our years in Children’s Ministry, he has been given the opportunity to design Children’s Ministry departments all over the country. He has also painted a bit for us!! This is a pre-school department in Shreveport, also in progress. They did a Garden of Eden theme. What’s your gift? How are you using it? These are questions I have been asking myself lately!! Thank you Lord for all the wonderful gifts you give. Help us all to see and appreciate the gifts in ourselves and each other, and to use them in the way you want them used. May we always glorify you Lord!! Oh my, what a weekend!! I spent the early part of Friday running around like a chicken with my head cut off trying to be organized for Saturday (I had a wedding to do) before Dan came home. As you read, Friday afternoon I was buried in cupcake frosting, I was preparing for a big wedding I had to do Saturday. At the last minute, I realized I had forgotten to order something and ran around and called every place I knew to call and couldn’t find what I had to have. I came home very upset and decided to call one last place that isn’t usually very nice about things like this. As I sat down, I said “Please Jesus, let this work out, I am out of options.” And as you probably guessed, it did, which is wonderful, and He is always faithful, but I couldn’t believe I had, yet again, tried to handle this all on my own without relying on Jesus to help me. I waited until I was out of options, ugh!!! We did get Dan back late Friday evening, he had been flying and in airports for 27 hours, but boy were we happy to get him!! The boys and I took my granddaughter with us to pick him up and she was so excited. She ran and hugged his legs as soon as she saw him. Such love. He did spread the love around, although I did have to mention on the way out of the airport, walking behind them holding hands, that before her, I was his favorite. Oh well, not much better than Papo and his one and only granddaughter. Saturday I had to do the cupcakes for a cupcake tower, for the wedding reception. I am officially retired from that business, but still bake for friends and family, and after 228 cupcakes all baked, frosted and garnished, I remembered why I retired at the age of 44. Since these were for friends, we also attended the reception and boy I was exhausted by the time we got home. Poor Dan was so jet lagged, I was surprised he stayed awake. Sunday, we just enjoyed our kids!! My favorite time. We spent time in the word together and talking about what we are doing. There’s nothing better than hearing your kids read the word and get excited about what it says or how they can apply it. Oh, and we did get to spend a bit of time on the porch in my new chairs. They make me smile!! To end the busy weekend, Shane came home from his Drill weekend!! He did inform us that his deployment to Afghanistan has been moved up to March, stink!! It’s so hard on a momma’s heart, but we know God has His hand on Shane no matter where he is and we also know we have almost a year to pray hard for our hearts to be aligned with His will in this. So much going on right now and so wonderful to see Jesus so clearly in our lives. Believing you all had a fabulous weekend!! Can anyone say buried? That’s what I am, buried in pounds of cupcake frosting. Tomorrow it will be hundreds of cupcakes. Just wanted to pop in, say Hi and when I dig my way out of this, I will post pictures. Oh, and by the way, it is so awesome that even when you make a really stupid mistake, Jesus shows up in a big way and saves the day. Thank you, thank you, thank you!!! Oh and the best news of ALL, Dan is coming home late tonight!!! YIPPEE!!! Have a fantastic weekend and if you get a chance, eat a cupcake!! I don’t know about you guys, but Dan and I talk a lot during the day. Not a lot of time usually, but we have short conversations several times during the day. We have always been that way, and that being the example, our kids are that way too. My grown ones call me once or twice a day, just to say “Hi” or to just check-in. As you know, Dan is in China, he does business there several times a year and it really puts a damper on our communication. There is a 13 hour time difference, so when he is up and not working, it’s the middle of the night there. When I am at a good point to talk, it’s the middle of the night there. I say, “Oh, well, the middle of the night is better than not talking to him.” So we do what it takes to be able to talk. I get up way earlier than normal and he stays up later than he should sometimes, but it is well worth it. Just the thought of not being able to talk to him sure makes me appreciate being able to when he is here though. This trip has made me think about talking to Jesus, do I take that time for granted too, do I appreciate it like I should? Do I spend the time with Him I should? Or, do I go through my day knowing I can talk to Him whenever I want, giving Him only bits and pieces. Do I get so caught up in my life and what I have to do that sometimes He gets what’s left? What if He was on a different time zone than me and I could only talk to Him in the middle of the night, would I get up and give Him that time? Would I appreciate it more? Would I make it top priority always because He isn’t always available? How does He feel about it? "It is a JOY to Jesus when a person takes time to walk more intimately with Him. The bearing of fruit is always shown in Scripture to be a visible result of an intimate relationship with Jesus Christ." He thinks it’s a JOY to talk to ME!! Why as human beings do we want what we can’t have and not always appreciate what we do have? Jim Elliott said - "O, the fullness, the pleasure, the sheer excitement of knowing God here on earth." I wish I could say that I always give Him the time He desires, but the truth is, sometimes I don’t. Dear Lord, as it says in Psalm 16:11, show me the way of life, grant me the JOY of your presence and the pleasures of living with you forever. Let this always be the desire of our hearts!! I am joyful because I bought my “old fashioned” chairs for the front porch, put them together (didn’t want to wait on hubby to get home) and will be posting pictures of them soon. Believing the Lord will continue to use these chairs, and other things, to remind me to be still and enjoy Him and the people I love. I am joyful because when Shane, my son, leaves Friday for his Army training, he will be coming home soon. There isn’t much better for a mom’s heart than seeing her son in uniform coming up the walk, safe and at home again. I am joyful because I have won not one, but two contests this week, the charm I blogged about previously and a book from Kat at Heart 2 Heart. How awesome is that! I am joyful because when I look out my front or back windows, I see the beautiful flowers that, I believe the Lord created just for my pleasure. Thank you Jesus for the beauty of all your creations. I am joyful because I am getting my herb garden planted. We love growing and cooking with fresh herbs. One of the many joys of summer. I am joyful because Ella (granddaughter) who was born 3 1/2 years ago with so many heath issues has been completely HEALED and is a rambunctious little girl that I get the privilege of cuddling with on a daily basis. Thank you Jesus for healing her precious little body. I am joyful because the Lord is daily working on my heart and helping me deal with all the issues and emotions of losing my mom. I still have days of weepiness and even anger, but they are getting easier to deal with. Praise Jesus. I am joyful because I have family and friends, old and new, who encourage me and love me on my good days and my bad, who lift me up to Jesus even when I don’t know I need it. I pray that I am always the kind of friend who sees the hurts, the needs, and the joys and continues to love and lift all the days of my life. I am joyful because I have Jesus, He loves me and cherishes me, He sees all the holes in my heart and life and heals them, He gently and sometimes not so gently points out my faults and helps me work on them, He had blessed me beyond imagination, He knows my path even though sometimes I don’t, and He is bringing so many wonderful bloggy friends into my life. What more could a girl want!! Have a very blessed and joyful Wednesday!! Once upon a time, many, many years ago, there lived a single mom with two wonderful kids, one girl, one boy. This single mom was struggling to spend as much time as she could with her beautiful children, work full time to make ends meet, keep house with the little time she had, and cook decent food with a very small amount of money. She was as content as she could be with her life, at the time. She was so busy with life, she didn’t even realize she was walking the wrong path. She didn’t know there was another plan. As a kid, she had gone to church with her “Nanny” (grandma), gotten saved, but due to a really bad experience, only associated “church” with pain. The rest of her life had been filled with so much dysfunction, that she believed this was as good as it got, this was her lot in life. She had built so many walls around herself, she had pushed away all her friends, she had even unknowingly, pushed away Jesus. She didn’t know Satan was stealing her joy and that all she really needed was Jesus. One day, while toiling away at the office, she met the company artist, a handsome, single man who was liked by all the lovely ladies. She, however, didn’t care for him too much. She really didn’t think men were all they were cracked up to be, at this time. You see, she had just gotten out of a very ugly marriage, from a not very nice man (not that she was perfect) and she knew she wanted to spend the rest of her life with only her kids. This single man was also pretty convinced he didn’t need a lady in his life either. But as time went on, he became like the flirty little boy who sat behind you in first grade and pulled your pigtails, annoying, but too cute to ignore. Eventually, he wore her down, broke through all her walls, and about three years later, she agreed to marry him. He whisked her away to a beautiful park in Florida for the ceremony, they spent some time with Mickey Mouse, did some romantic walking on the beach, and then it was time to head back to his new reality (a wife and two kids). It wasn’t too long before they became aware that baby would make five. It was a beautiful, baby boy and they were thrilled. It was about this time the “train your child up in the way he should go” verse started becoming their reality. She had quit “church” at a young age, but her Nanny had taught her about Jesus, and was still praying for her. He, however, had not been raised in church, but had also gotten saved early in life, and her Nanny was praying for him, too. Both knew Jesus should be the center of their marriage and family and together set out to make it happen. Boy, did they ever jump in with both feet and before they knew it, everything in their life had changed. Teaching children about Jesus became their heartbeat. No child they came in contact with would not know how wonderful Jesus is and what a difference He will make in their lives, if they let him. Soon, babies four and five came, identical twin boys. WHAT A JOY!! Oh my, how the Lord was blessing them. Time began to fly and before they knew it, their only daughter got married, and had their very first grandbaby (a princess), their four sons still live at home with them and keep their lives busy and full of laughter. In May, it will be twenty years since the day she was whisked away to that beautiful park in Florida, by that, so called, annoying man she didn’t care too much for. She didn’t realize it at the time, but he was her true Prince Charming. They have lived and loved, laughed and cried, they’ve had lots of ups and lots of downs, but they continue to praise Jesus together and stomp on the devil together. She thanks Jesus for him everyday and she is overjoyed that, together, with the help of their Lord and Savior, they have created a Christ filled home for their family. They are in awe of Him and all He has done for them and through them. The best part is all these years later, knowing all she knows now, she would do it again in a heartbeat, and they are still living happily ever after. When I was growing up, my mom was kind of a hit and miss mom. I didn’t get to spend a lot of time with her until my high school years and then we had more of a friendship then the mother/daughter relationship, I didn’t know, I needed. When I started having kids, all the hurt of her not being around while I was growing up came crashing in on me and I had to struggled to even maintain a relationship with her. After spending a lot of time with Jesus and realizing that she didn’t make the decisions she made because she didn’t want me, I was able to forgive her. I also had to forgive myself for years of unforgiveness. Fast forward a bunch of years to this past August, at the age of 65, my mom passed away, it was very sudden and unexpected. I was so in shock, she was so young, she should have lived another 20 years, at least. Unfortunately, she hadn’t taken very good care of herself, she had spent most of her life addicted to prescription pain medicine, and it all caught up with her. When she passed, there I was again, if only I had made the most of the times I did get to spend with her..., if only I had tried harder to help her..., if only I hadn’t spent so much time not forgiving her and spent more time loving her, would things have been different? I don’t know the answers to all the if onlies of my life, but I do know there is someone who wants an amazing relationship with me, someone who loves me no matter what, someone who thinks I am all that, someone who was willing to die for me, someone who wants to listen to me even when I am rambling, someone who wants to be with me even when I am not at my best, someone who loves me even when I fail, someone who teaches me to forgive, someone who teaches me to love unconditionally, someone who will never leave me. I know that I want to live my life with purpose, loving like Jesus does, forgiving like Jesus does, and someday when I am gone from this earth, whether it be when I die or when He returns for me, I want to stand in front of Him and not have any if onlies!!! Thank you Jesus, for loving me, faults and all. Thank you for teaching me to forgive, and love unconditionally. Help me to shine Your light to everyone I encounter. Teach me to make the most of every opportunity you place before me. Lead me and guide me to live with purpose so I don’t have any if onlies in my life. Show me the areas of my life where I need to replace me with You!! You are an AWESOME GOD!!! I won the scalloped initial bonbon charm Confessions of a Tired Super Girl (http://tiredsupergirl.blogspot.com/) was giving away. I don’t mean to brag, but I don’t usually win anything. I am so excited. I haven’t been blogging long and haven’t entered many give away contests, but am I ever glad I entered this one. 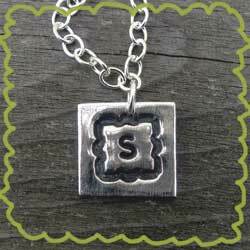 I pulled this picture off her blog but will post a real picture when I get the charm. I can only imagine how excited I will be to see all our treasures in Heaven when I get this excited about an earthly prize. Now off to buy my chairs (see post below). Yippee!!! 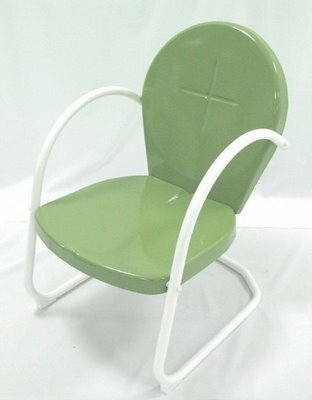 The other day, I was shopping for flowers, at Lowes, which is one of my favorite things to do, when low and behold, to my amazement, I ran into some very retro patio chairs. The memories immediately started flooding in. I remember, as a kid, my grandparents having chairs like these on their porch when I would go visit. It seemed every time we pulled up to their house, one, if not both, of them would be out on the front porch, sitting in those chairs with a glass of tea, enjoying whatever season we were in at the time. I remember a great aunt we visited often, in Arkansas, having a huge wrap around porch and those chairs were scattered all over it. She too, with some other relative or friend, would always be out on them when we pulled up. It seemed as though all the, what I though were, old people of that time had these chairs. I don’t really remember thinking they were all that cool back then. I don’t even really think I though too much about the fact that someone was always in them. I don’t think I really gave them too much thought at all. I do know that when I found them at Lowes, I immediately wanted some for my own front porch. However, I controlled the urge and came home without them. Usually when that happens, I leave the store without the great find, I tend to forget about it and live without whatever it was that I thought I couldn’t live without at the time. This time is different though, I have continued to think about those chairs. I think I relate them to a slower way of life. To a time when people sat on their porches for extended periods of time enjoying the outdoors, enjoying their kids, enjoying their neighbors, enjoying friends who just dropped by, just being still and enjoying. I think, for the most part, we aren’t the typical American family. We do things a little differently than most of the families we know. I’m a stay-at-home mom, we homeschool, we don’t get involved in every extracurricular activity, we pick and choose carefully what we fill our lives up with, we eat dinner together every night, we have “Family Night” every Friday, and we read the Bible together. Even at that, we are running crazy!! Always things that need to get done. I think some would say I was born in the wrong decade, but I long for the stillness, the simplicity of yesteryear. Relationships that were built on those chairs with tea (although mine would probably be pop or coffee) and homemade cupcakes, cookies or sweetbread. I have been labeled “The Sweet Lady” (as in sweets, story for another day), so I tend to have the homemade goodies around, just not enough time to enjoy them like I would like, with all the people I would like. I think I will buy those chairs and give myself a constant reminder to slow down, to enjoy life more, to enjoy Jesus more, to enjoy friends more (old and new), to be Jesus to my neighbors more, to just “Be still and know that HE is God”. Thank you, Jesus for always showing me what You want from me, for always loving me and nudging me to do Your will. Thank you for Your Word, no matter the situation, there is always a verse to fit. Help me to slow down, to enjoy the blessings all around me. Help me to see through the world and into the person You have changed me to be!! Who knows, maybe someday you can join me for sweets and a drink in these chairs on my front porch!! Won’t that be fun. I am joyful because even though my son-in-law is losing his job. God has a plan for their lives. I can’t believe this day has gotten away from me and I haven’t had the time to post something. My husband left today for another business trip to China, so we were busy getting him off. His departure is always a sad time at our house, so I try to keep myself and the kids busy. Thank the Lord I have so many kids to keep the house buzzing and full of life. Not sure I would know what to do with myself if it was quiet. I thank Jesus that we have been together as long as we have and I still miss him so much when he is gone. Please keep him in your prayers as he travels and does business abroad!! One of my sons attends Oral Roberts University and this weekend they hosted an Empowered21 Conference. Drew told us weeks ago that someone had donated enough money for all students (and there are thousands of them) to be able to attend the conference free. How awesome is that!!! Anyway, the new school president, Mark Rutland, who is amazing and is helping transform that school back into what God intended for it to be, cancelled classes so the students could attend, not only, the big general sessions but also any breakout sessions they wanted. I was so excited for Drew to get to attend this conference. I will add that I was a bit jealous too, the price tag was kind of high for us to take the whole family. So we stayed home and looked forward to getting a play by play from Drew. On Saturday he told us he received an email saying Saturday evenings general session was going to be open to the public, free of charge, Yippee!!! We all went and it was absolutely wonderful. There was a pastor there from every continent who spoke. Boy, was it ever exciting and JUST WHAT I NEEDED. They spoke on lots of things, but the main focus was on missions, winning the lost, you know the whole reason we are here, but one of the easiest to forget. I know I get way too caught up in my life sometimes when I need to be still and remember that this is not about me and what I have to do, it is about Jesus and what He already did. One guy said “We should be like an upside down tree with our roots in heaven and our fruit falling on this earth.” That really made me think!!! Am I keeping my roots in heaven or letting them slip back down occasionally? What kind of fruit am I bearing? Am I good fruit or bad fruit? Is it falling on good ground? Am I diligently seeking those in need of Jesus? Am I saving it only for the ones “I” think need it or am I sharing it even with those less likely souls? Am I letting my life be the example Christ wants it to be? Or am I letting “me” get in the way of all that? I know we all have a part to play in this world but I also know it is a choice. I pray that we can all stay focused on what He wants and not what we want!! This year, for the first time, Adam and Isaac, played an organized sport, Basketball. They have battled chronic asthma all of their lives, so it was a huge deal for our family. They had such a good year. They played hard, learned a lot, and were determined to come out on top of this asthma thing. With the season being over, we can proudly say - Mission Accomplished!! Last night we attended their basketball banquet. We homeschool our kids, so it wasn’t the average sporting event. They did mention how well the kids played the game and briefly mentioned star players who went above and beyond. The best part of it though is they spent the entire evening giving awards for positive biblical character traits. My boys received wonderful awards. When presenting them with the awards, the coach gave examples of their behavior to warrant them. We felt the coach picked very appropriate traits for them. We were so proud. We try hard as parents to teach our kids how to behave as Jesus wants us too, but it is always wonderful to know that someone else sees these things in your kids and that your kids exhibit this kind of behavior when you aren’t always there watching. On the way home, of course, the boys were excited and talked a lot about their awards and the awards of their teammates. They repeated all the stories and how appropriate they thought the awards were. While listening to this I couldn’t help but think about Jesus and how He feels about us. It’s our choice whether or not we do what our Father wants us to do just like it was Adam and Isaac’s choice. My first thought was how disappointed He must be when we make the wrong decisions or do the wrong thing, but He quickly stopped that line of thought. He does want us to live obedient to His word, to strive to make good choices, but I was reminded of what a loving and forgiving Father He is. I thought about the times my kids have been disobedient or done the wrong thing, was I disappointed in the behavior, yes, did I wish they had made a different choice, yes, but did it change how I feel about them, no, did I easily forgive them and love them all the more, yes!! I then began to wonder about how pleased He must feel when He sees us doing His will. When He sees us loving one another, when He sees us serving others, when He sees us making Godly decisions, when He sees us walking the walk and not just talking the talk. How wonderful it will be to stand before Him one day and hear Him say how pleased He is with us. (Gives me chills). I pray that I always strive to be what He wants me to be. To try in every area of my life to be obedient and pleasing to Him, and that when I make mistakes, I always come before Him with an apologetic and humble heart.